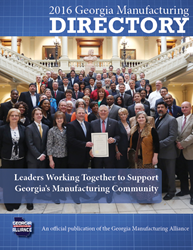 Manufacturers find a win-win solution in the Georgia Manufacturing Directory. Georgia manufacturers now have the ability to identify quality local suppliers and prospective customers. Finally, one simple solution for two major challenges faced by manufacturers… Over the past eight years, members from the Georgia Manufacturing Alliance (GMA) have toured a variety of manufacturing plants around the state. During these tours, executive leaders often comment that they want to do more to support the local economy, but find it difficult to identify companies in their community who manufacture the goods and services they need. The results of a recent survey of industry leaders indicated that the most important issue facing manufacturers is sales and marketing. Manufacturers are great at making things, but are searching for more effective ways getting their product to market and growing sales. “We are constantly looking for new and innovative ways to help support Georgia’s manufacturing community. By providing this tool, our GMA members are seeing great results already,” said GMA, CEO Jason Moss.